Entries with tag wellness . 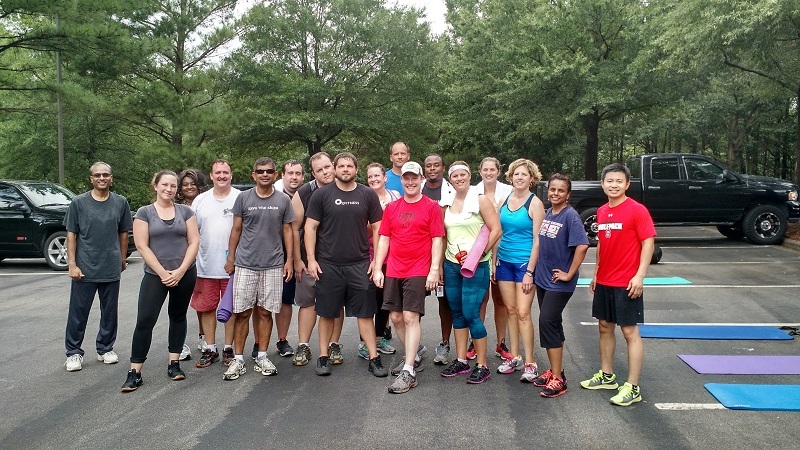 Railinc's culture of wellness is strong, and there are many ways to keep active here, from running on the greenway to on-site boot camps to yoga. Some people swim or cycle, and others get together for team sports like softball, ultimate and cricket. For the last five or six years, a group of Railinc employees has made the short trek to the sand volleyball courts at North Cary Park every Tuesday, Wednesday and Friday to play at lunchtime. It’s popular, sometimes attracting enough employees to have two games going simultaneously. And it has spawned a team—the Railspikers—that regularly participates in (and wins) local volleyball tournaments. The other members of the Railspikers are Raj Mallarapu, Srikanth Maddukuri, Sandeep Pailla, Vishnu Kandi and Nagi Guntaka. On September 24, the Railspikers, along with a few players from outside the company, won the 2016 Sewa International charity six-on-six tournament, beating out 26 other teams. It’s just their most recent trophy. By participating, the Railspikers helped raise money for Sewa’s “Sponsor a Child” program and a Mumbai foundation that helps children who live on the streets. You can see photos from the Sewa tournament on Facebook. And two weeks before that, the Railspikers, won the Triangle Area Telugu Association six-on-six tournament. In June, they outplayed eight other teams to win the inaugural YHC Sand Volleyball Tournament. Proceeds from that tournament went to the nonprofit YourHelpCounts Foundation, which used the funds to donate 100 solar study lights to rural schools in India. Last year, they won six-on-six sand volleyball tournaments in Cary held by Sewa, the Triangle Area Telugu Assocation and the Greater Carolina Kerala Association. The Railspikers also participate in the Town of Cary’s adult indoor volleyball league. The team’s success has inspired a second group of Railinc employees to start a team—RailHulk—and to compete in the same indoor volleyball league as the Railspikers. RailHulk team members are Ramesh Veerappan, Ganesh Subramanian, Jeff Yusiewicz, Chip Summey, Brian Childs, Murali Bobba, Murali Muthyam and Nanda Navarathnam. Stop by the Railinc office at lunchtime on any Monday or Thursday and you'll likely encounter employees running figure eights around the parking lot, doing burpees by their yoga mats or carrying a 20-pound medicine ball up and down stairs, all under the watchful eye of a personal trainer from O2 Fitness. The free, biweekly boot camp is part of Railinc's Wellness Program and is open to all employees. It's been a hit, too, with as many as two dozen employees turning out for the two, hour-long sessions. Jack Ngui, a senior software developer, stays active on his own, running, lifting weights and swimming. He has run half marathons and shorter races. The boot camp, he said, has been a great way to add variety into his routines. "Our trainer has us do exercises that I don't normally do, and it's nice to incorporate them into my workout routine," he said. "The beauty of boot camp is you can take it easy or push yourself as hard as you can." The benefits go beyond the physical, though. "We get to interact with colleagues that we don't normally work with," said Ngui, who has participated in the boot camps since they started in fall 2014. "And we have a chance to have fun together and get to know each other." In 2012, Railinc launched the voluntary wellness program, which gives employees resources to get active, make healthy lifestyle choices and save money. The program includes free, on-site nutrition counseling, free memberships to the O2 Fitness health club, lunch-and-learn sessions, free chair massages, a free Fitbit, and fun, companywide Fitbit challenges. Earlier this year, for a coast-to-coast Fitbit Challenge, teams of employees competed to see who could log 2,689 miles (the distance from Wilmington, N.C., to Santa Monica, Calif.) the fastest. Employees participate in tug of war at Railinc's 2015 fall event. Employees also have access to an on-site gym and yoga, and they can get active on the nearby greenways and at a city park less than a mile from the office. Railinc also sponsors an annual company 5K race and walk, a fall event with games and prizes, and recently began providing free fruit in the office's main kitchen. Thanks to the program and employee participation, Railinc was named a Healthiest Employer in the Triangle by the Triangle Business Journal in 2013, 2014 and 2015. "Having a culture that supports wellness is important," said Kristen Sandstrom, Railinc's human resources director. "Healthy employees keep Railinc's health insurance costs lower. But they're also more engaged with their work, get to know their colleagues better and they just feel better. Plus, they're developing healthy habits we hope will last." A Railinc employee gets pointers on healthy eating at an on-site cooking demonstration. For some employees, those habits include being more informed and deliberate about their food choices. To help them, Railinc works with a nutritionist partner who provides private, on-site, one-on-one nutrition counseling. It's a popular offering—open slots fill as soon as they're posted to the company intranet and employees who work with the nutritionist get weekly emails with healthy recipes and tips for making good food choices. Tracy Brewer, a senior product support specialist, has worked with the nutritionist since Railinc introduced the benefit in 2013. The regular meetings have given Brewer the support she needs to make positive lifestyle changes, including mapping out a food plan, staying active, and keeping healthy snacks at her desk and at home. "It's very convenient that she can come to us," Brewer said. "She keeps me in line, and I just enjoy talking with her and feeling like I have someone who understands me." Healthy employees also have a positive impact on a company's bottom line. According to the Centers for Disease Control and Prevention, healthier employees are less likely to need to use sick leave. For example, obese men use 56 percent more sick days per year than normal-weight men. Healthier employees (and a wellness program that supports healthy lifestyles) help Railinc better manage its annual health insurance costs. Because of the Wellness Program and healthy lifestyle choices employees have made, Railinc has been able to mitigate annual increases in health insurance premiums. Coming into this year, Railinc saved more than $180,000 in renewals, keeping both employee and company costs low. Ninety-nine percent of Railinc employees participate in the company’s wellness program. "It's real money in our employees' pockets," said Allen West, president and CEO. "We have a generous health insurance program at Railinc, and we do a lot to maintain that. But our employees know they can have an impact on what we pay for health insurance, and they work hard to help keep those costs low." How low are the costs? Employees pay less than $150 per month to insure their families under Railinc's PPO plan. Overall, Railinc employees spend on average $2,400 less each year on their medical deductible than employees at other companies and $8,200 less per year on health insurance. Railinc also provides employees and their families with free dental and vision coverage, as well as free confidential counseling. Each year, employees must complete a physical exam with their personal doctor, complete a health risk assessment and participate in an on-site biometric screening that measures indicators including cholesterol and BMI. They have to meet defined standards or show improvement in their BMI from the previous year. participate in twice-weekly, on-site boot camps and pay lower health insurance rates. Even if an employee doesn't meet the BMI standards or show improvement over last year, it doesn't mean they'll pay higher insurance rates. Railinc has an alternative reasonable standards program that includes options like health and wellness education, fitness classes, a weight management program and online programs from Railinc's health insurance provider, UnitedHealthcare. "The Wellness Program is designed to give Railinc employees the resources they need to make healthy choices," Sandstrom said. "We don't exclude anyone based on things like their level of activity or whether they've dropped 10 pounds in the last 12 months. The program gives employees a variety of ways to satisfy the requirements and realize the health insurance savings." While decisions around the health insurance program are made at the executive level, employees drive nearly all other Railinc wellness initiatives. Railinc's wellness team, a 12-person group of employees from across the company, meets biweekly to plan wellness activities, from lunch and learns to Fitibit competitions to an annual fall event, which this year had employees competing in field day activities like dodgeball and tug of war. A team of Railinc employees coordinate the company's wellness activities. Wellness team members also manage Railinc partnerships with companies such as O2 Fitness, which provides trainers for the on-site boot camps, and Go Local Produce, which delivers fresh fruit each week. "It's a lot of fun working with our colleagues to develop these initiatives and activities," said Latetia Coston, a wellness team member. "From the team's perspective, it's exciting to see our fellow employees get involved, get enthusiastic about health and wellness, and see positive results." For the second consecutive year, the Triangle Business Journal named Railinc as one of the 35 Healthiest Employers in the Triangle. The list recognizes employers in the region that make "wellness a priority while proactively shaping the health of their employees." Railinc joined a stellar group of companies and organizations on the list, including Lenovo, WakeMed, the Raleigh-Durham Airport Authority and Fidelity Investments. "We've made wellness an important part of our culture because it has a positive benefit for our employees and the company," said Kristen Sandstrom, director of human resources. "We're proud of this recognition, and it's a testament to our employees and the healthy choices they make every day." 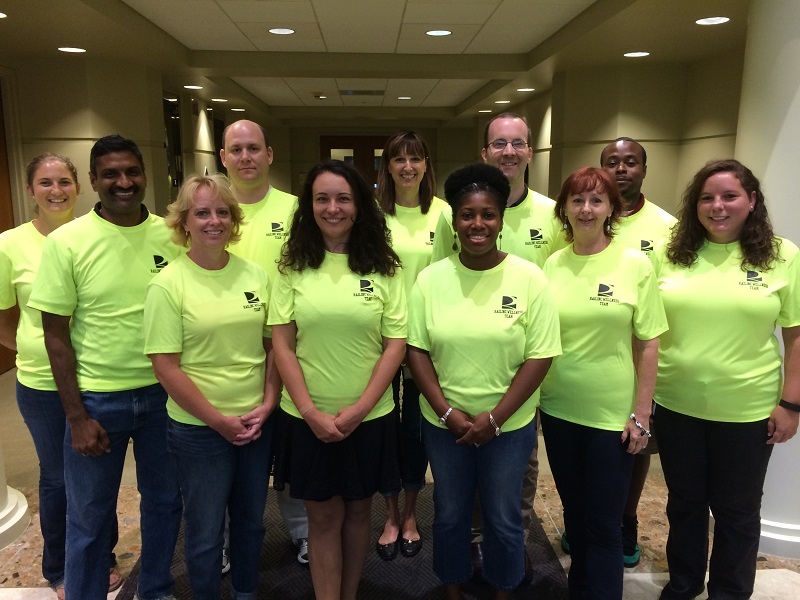 So what does it take to be among the Triangle's healthiest employers? It doesn't take a work force full of athletes. While a few of our employees played college sports, we're mostly just like everyone else—we enjoy weekend runs, a lunchtime walk and pick-up volleyball at the park near the office. Fitbit Challenges: We give every employee a Fitbit fitness tracker, and our people compete in regular Fitbit Challenges to see who can log the most steps and rack up the most miles. On-site Nutrition Counseling and Education: Want to set up a healthy eating plan or learn how to make a tasty smoothie? We offer free, on-site, one-on-one nutrition counseling, as well as educational opportunities like wellness lunch and learns and healthy cooking demonstrations. Free Access to Gyms: Employees can just walk downstairs to work out in our newly renovated gym, and Railinc subsidizes memberships to O2 Fitness. Yoga, Bootcamp and Activities: We have many ways to get active with our colleagues, from yoga in our largest meeting room to on-site boot camp sessions led by O2 Fitness trainers to employee-led sports teams and activities like a company 5K race and walk. Easy Access to Outdoor Activities: Railinc's office is adjacent to a private greenway and a short walk to a Town of Cary park with basketball and sand volleyball courts and to trails that connect to Lake Crabtree Park and Umstead State Park. We're seeing results. Many employees have made significant changes to improve their health, getting more active, losing weight and eating better. Almost everyone has gotten involved—our participation rate since launching the Wellness Program is more than 99 percent. The company has benefited, too. The program has helped offset increases in our health insurance premiums in each of the last three years and has enabled Railinc to realize significant cost savings, which get passed on to employees. Click here to see what it's like to work at Railinc and to learn more about our culture and benefits.